The year was 1993, the sun was shining and everything looked so promising, the future couldn’t look brighter. The competition season had started in an outstandingly good way, couldn’t be better, me (Eva Perninge) and Cavat had made good results and this was crowned during the summer by a victory in the Swedish Team Championship together with Louise Nathhorst / Walk on Top and AnneSophie Mannerfelt / Athletico. Then, in the middle of this bright time it happen – Cavat got sick, and after a colic surgery, this amazing horse died. I was inconsolable and Lussan one of my absolute best friends did what she could to help me through this deep sorrow. During the fall of that year, I went with Lussan to the equestrian sports fair, since Lussan would be there to meet here sponsor. Once there, the question was raised if I would be interested to start an equestrian store at Hogsta, the equestrian centre my husband and I own. Since I basically do not like to buy or sell, the spontaneous answer was "no, that isn’t for me". Eventually, the thought began to grow and Hogsta Ridsport became the sorrow work I needed so much, the premises was already there, the insurance money became the starting point and I put down all my soul in to create something new. The opening of Hogsta Ridsport was in the beginning of December 1993. Now it’s time for a new era at Hogsta. The obvious orientation became dressage because it is my passion and it is within that field my competence lies. I think that we will be good at what we like and I really like dressage. Choosing products with high quality is also obvious when you have worked with horses as many years as I have, then you know that quality pays off. From the beginning there was a very small shop located at the indoor arena at Hogsta Equestrian Centre, as years goes by the shop expanded both with a larger range and a larger premise. Since I really love to learn and develop, I got the idea to start the web shop hogstaridsport.com already in the early 21st century. Sayed and done, but it was not quite easy, this was a whole new area that not many people knew anything about. At 2012 Hogsta Ridsport was facing a new interesting time. Karin Persson, who currently works as a professional trainer and rider in Wellington, USA, received a part-time job at Hogsta Ridsport to help and assist in the development of the equestrian store. So far, the store did not have my absolute focus, I rather focus on my horses and the equestrian centre how is really important to me. As I said, it was also not in my interest to buy and sell things, it just felt uncomfortable for me. During 2012 things started to happened, it was time to start hiring more people but there was one problem, the store was now to small and to hard to work in which let me to reconsider a new premise. It didn’t feel right to look at other premises outside Hogsta Equestrian Centre since Hogsta Ridsport is close connected to the Equestrian Centre and all the wonderful relations that we have here. At the same time as the plans for the store was growing on one side, I must consider the equestrian centres future on the other side. 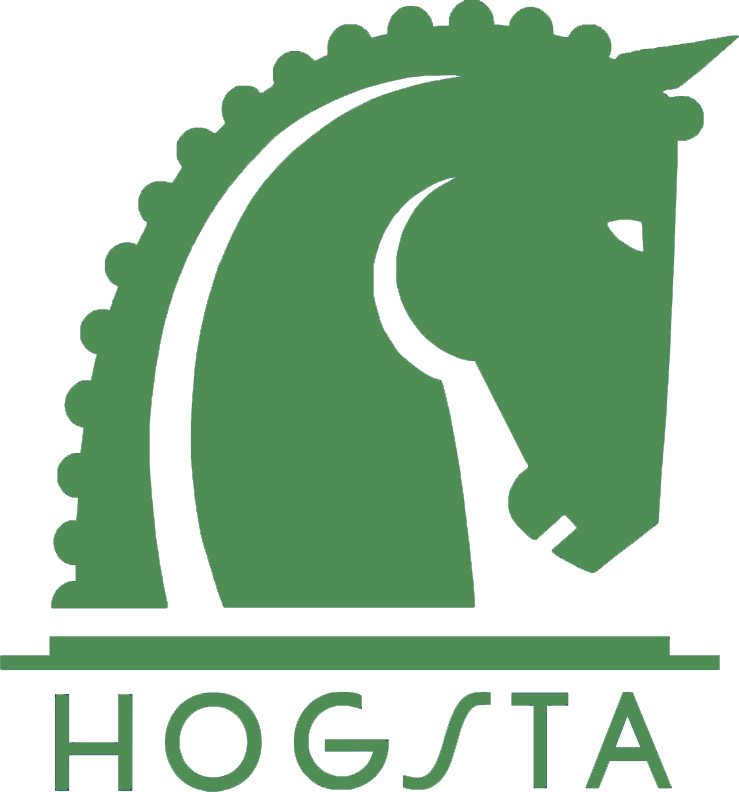 Hogsta Equestrian Centre is an amazing farm, located only 15 minutes from Stockholm City. This is a really old property dating from the 18th century, which me and my husband have the privilege of operating for many years and since 1992 also own. At the equestrian centre we use to have 65 horses boarder but after some changes that was demanded in connection to the renovation got me thinking, maybe “the big stable” could be the premise I was locking for. After a lot of feelings within me and from our customers the choice was clear. This is the perfect premise, so beautiful, so exclusive in a real stable. It was in autumn 2015 that the store got its new premises and with it came the big change. We love it here, me and my co-workers and all of our lovely costumers. The old stable is in an environment that fits so well for the purpose, beautiful surroundings and with a warm feeling. And now 2019 we are ready to take on the whole world´s riders, horse owners and others that share the same passion for horses and equipment that we do. Now we take the steep and goes worldwide. The goal has always been to provide the customer with the help, knowledge and equipment that it needs, it's the big driving force, much bigger than just selling. Today, the business is run by people who are really passionate about helping and serving you as a customer. Our products are selected carefully and take into account ethics, environment and morality in every step from manufacture to final stage of delivery. Here at Hogsta Ridsport we are a team that works to create the best conditions for you as a customer to get the best experience when shopping from us, regardless of what you are looking for. This is Hogsta Ridsport, today and tomorrow.